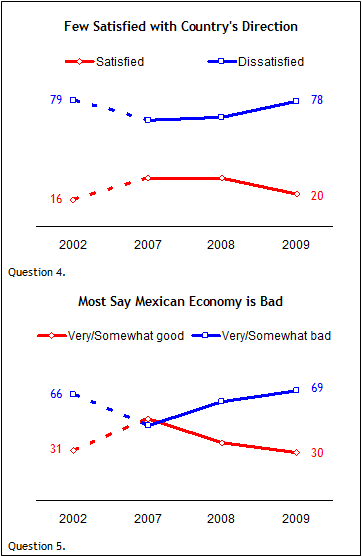 Overwhelmingly, Mexicans are dissatisfied with the way things are going in their country. About seven-in-ten say the nation’s economy is in bad shape, although most say it will improve over the next year. Respondents see a variety of problems facing their country: crime, drugs, economic issues, corruption, pollution, and people leaving in search of jobs in other countries. Most also think Mexico has problems with its international image – only about one-quarter say they believe their country is well regarded abroad. And there are clear signs of concern about the swine flu (also known as the H1N1 virus). When the survey was conducted, more than nine-in-ten had heard of the virus, and most were worried that they or one of their family members could be exposed to it. Even so, Mexicans were generally no more concerned about swine flu than others around the world, despite the fact that the 2009 outbreak was first reported in their country. Nearly eight-in-ten Mexicans (78%) are dissatisfied with the country’s direction, up 10 percentage points from last year. This view is common across Mexican society – large majorities of every group analyzed in the survey are dissatisfied with the way things are going. Views of the economy are only slightly less negative – 69% describe the current economic situation in Mexico as very or somewhat bad, up seven points since last year. The change has been even more dramatic since 2007, when the percentage rating the economy as good (51%) slightly outweighed the percentage rating it as bad (47%). However, most Mexicans are optimistic about the prospects for a better economy – 61% expect it to improve in the next 12 months, while only 14% think it will get worse and 24% believe it will stay the same. Mexicans are more optimistic about the economy now than they were last year, when 42% said it would improve in the ensuing 12 months. Most Mexicans see a variety of challenges facing their country. Nearly all of those surveyed rate crime a big problem, and 81% say it is a very big problem. The share of the public describing crime as a very big problem declined significantly between 2002 and 2007 (from 81% to 64%), but now these concerns are back to the 2002 level. Worries about illegal drugs have also increased over the last two years – 73% now consider illegal drugs a very big problem, compared with 65% in 2007. 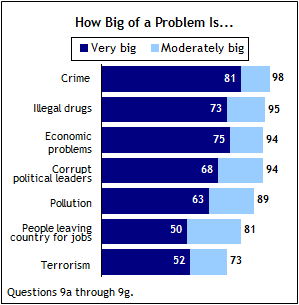 More than two-thirds describe economic problems (75%) and corrupt political leaders (68%) as very big problems. And at least half believe pollution (63%), terrorism (52%) and people leaving the country for jobs (50%) are very big problems. 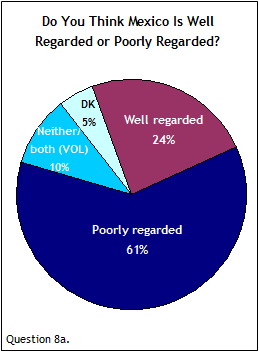 When asked how often in the past year they had to do a favor, give a gift, or pay a bribe to a government official to get services or a document that the government is supposed to provide, three-in-ten say they have had to do so at least somewhat often in the past twelve months, while another 21% say they have done it, but not often. 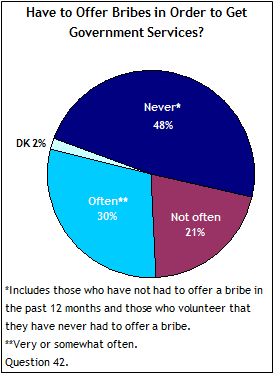 Slightly less than half (48%) say they have not had to offer a bribe in the past 12 months or volunteer that they have never had to do so. Most Mexicans say that, at this time, the government should prioritize law and order above individual freedoms. 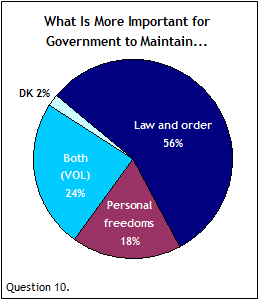 When asked which they believe is more important at this time, that the government try to maintain law and order or try to protect people’s personal freedoms, a majority (56%) choose maintaining law and order. Fewer than one-in-five (18%) choose protecting personal freedoms. About one-quarter (24%) volunteer that both are important. Awareness of the swine flu was widespread in Mexico when the survey was conducted in late May and early June. More than nine-in-ten (93%) had heard of the disease. Among those who had heard, a solid majority (63%) expressed concern that they or someone in their family would be exposed to it. Yet, compared to publics in 23 other countries surveyed where awareness of the swine flu was high, Mexicans did not stand out in their concern about the disease, which at the time the survey was conducted had killed more people in their country than in any other. Concern over the swine flu was particularly high among women. About seven-in-ten Mexican women (69%) who had heard of the virus said they were worried that they or someone in their family would be exposed to swine flu, compared with 56% of men. Those in the south, where the first swine flu death occurred, were somewhat more likely than residents of other regions to express concern about the disease; 72% in southern states said they were worried, compared with 65% in Mexico City, 62% in the north, and 56% in the central region. When asked about the Mexican government’s handling of the swine flu outbreak, an overwhelming majority of those who had heard of the swine flu (76%) said they approved of the job their government was doing, while 17% disapproved. Those who are affiliated with President Felipe Calderón’s National Action Party (PAN) as well as those who are affiliated with the Institutional Revolutionary Party (PRI), the opposition party, gave the government a good rating – 83% and 77%, respectively, said they approved of how the government was handling the swine flu. Respondents from Mexico City were somewhat more critical of the government – 26% in the capital said they disapproved of the government’s job in dealing with the swine flu, compared with 17% in central Mexico, 14% in the south, and 11% in the north. Still, majorities in all regions gave the government high marks. Most Mexicans believe their country has a poor international image. Roughly six-in-ten (61%) think Mexico is poorly regarded these days by people around the world, while only about one-quarter (24%) say it is well regarded. Mexico City residents are especially likely to believe their nation has a negative image – about three-in-four (74%) say Mexico is poorly regarded.